As politicians and business executives iron out the details of cannabis legalization, Rhiannon Thomas and Katrina Peters just want to know if smoking pot will give you cancer. The teens will be going into Grade 9 this fall. They already know a thing or two about cannabis — which they'd rather call marijuana. But they suspect there's a lot more that adults haven't told them. "They always want to sugarcoat it and they don't want it to seem really bad when you're a child," said Peters, 14. "I feel like we're not seeing the whole picture." Peters is worried about what could happen if pets ingest it. Thomas, 13, isn't sure why it's even being legalized in the first place. Neither of them plan on trying cannabis anytime soon, but they're still curious what it feels like to be high. 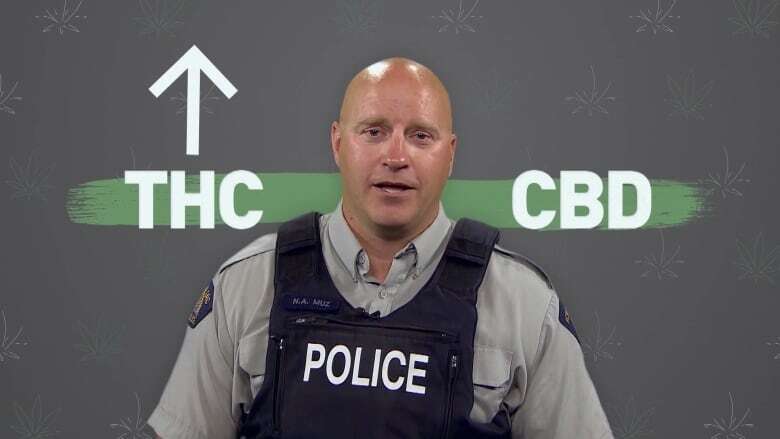 CBC took their questions to RCMP Const. Neil Muz, a school resource officer who oversees 16 schools in the Leduc area. He has taught the Drug Abuse Resistance Education (DARE) program for more than 13 years. The program teaches Grade 6 students in some Alberta schools about the dangers of drugs, alcohol and tobacco use. Muz gets a lot of questions about cannabis and other drugs, and he says none are too silly. His answers to the girls' questions have been edited for length and clarity. "A lot of time people do start with either smoking cigarettes or drinking alcohol, and usually marijuana would be the next one. I've seen people that are using the harder stuff like cocaine or methamphetamines, and I've talked to them and they always say they smoked marijuana, they started with that. I've also seen people that started with the harder stuff as well." "I have never smoked marijuana [and] never will, so I have no clue what it feels like. I hear it's just a high. They say it's almost like being intoxicated, you feel like you're mellow, laid back, you could get dizzy and stuff like that especially for the first few times you try it. But it's a feeling I don't want to experience." "It's got that skunky, yucky smell. It's a very sharp smell. You'll know it if you smell it." "Cannabis can still have the same effects as cigarettes and tobacco. The more you use it, the higher chance you could get cancer or other diseases from that." "It can be addictive. But usually no." "You would have to smoke or take in a crazy amount of marijuana. It's almost impossible to overdose on marijuana." Can cannabis change your appearance? "If they're impaired and their eyes are getting glassy and they're falling over, your appearance is going to look like you're intoxicated or impaired or high. So in that way, yes, but as far as your skin and stuff, no." Is it more dangerous to drive drunk or drive high, and what is the fine? "If you're impaired and it's affecting your driving, it would be the exact same. Impairment means you have no more control over yourself. Your brain is not acting the way it should be so your motor skills are no longer capable of reacting the way they should be when you're sober. "It is a $1,000 fine for the first offence. It all depends on … [how] high how you are as well. So there's ways that the police can determine the level by blood work or roadside screening devices which are coming into play hopefully soon. There also could be jail time as well." What the difference between cannabis and hemp, and THC and CBD? "THC would get a person high. The higher the THC level or percentage, then the more impaired or high you're going to be. CBD does not show any signs that it would make a person high, it actually could lower and block the THC level in the marijuana. "Hemp [has] ... a very low percentage of THC in there where it wouldn't get the person high. It won't get you high like marijuana would." What kinds of people consume or smoke cannabis? "There are no particular types. Anybody can smoke marijuana. You can't tell who smokes marijuana just by looking at a person. It can be anybody out there, your next door neighbour, your friends. It's not specific just to one type of person." What do you do if you're babysitting and a kid or pet finds cannabis and eats it? "I would definitely call first of all the parents and 911. It's just like kids taking a prescription drug, you don't know how it's going to affect [them.] It's best to get the emergency there. Not saying that they're going to die or anything, I don't know that. But I would definitely call 911 just to be on the safe side. "If a pet would use it, they would have probably the same reaction if they were drinking some alcohol. They would show signs that they're impaired too. It would affect their brain just the same as it would a human." What happens if a kid is caught smoking pot at school? "You can be charged ... there'll be some fines. What I think is going to happen is it's going to be treated just like alcohol. If you're caught drinking alcohol or consuming and you're underage, there's fines that you'll be facing. If you're doing it at school, you can get suspended or even expelled, depending what's going on. You can miss out on school as well." How do you stop kids from smoking marijuana? "Education. Keep telling them and showing them what the effects that marijuana or cannabis can have on your brain or body. Give them the choices. Show them the facts, don't lie to them, tell them what the facts are, and hopefully they can make the right choices." Muz says despite legalization, he will continue to teach the DARE curriculum as it is and answer questions as they come, to the best of his ability. He says it's important to be completely honest and open with kids about cannabis and other drugs. Kids should keep the questions coming, he said. "Don't be afraid to ask any questions," he said. "Your parents can definitely look it up if you don't have the answers, I know I do sometimes."